JEREMY FILSELL has established a concert career as one of only a few virtuoso performers on both the Piano and the Organ. As an organist, Jeremy's extensive discography comprises solo discs for Guild, Signum, Herald and ASV. He has recorded for BBC Radio 3 in solo and concerto roles and an extensive solo career has included recitals across the UK, USA, Australia, New Zealand, Germany, France, Finland and Norway. He served as a jury member at the Concours International pour l'orgue in Saint-Maurice d'Agaune on a number of occasions. He has recorded the complete organ works of Marcel Dupré (12 CDs) for Guild, Gramophone magazine commenting that it was ‘one of the greatest achievements in organ recording…' and 'Filsell’s astonishing interpretative and technical skills make for compulsive listening… truly distinguished, compelling and unquestionably authoritative performances; Filsell has phenomenal technique.’ In 2005, he recorded the six Organ Symphonies of Louis Vierne on the 1890 Cavaillé-Coll organ in St Ouen Rouen for Signum (BBC Radio 3's Disc of the Week September 2005). Recent recording projects have included two discs of French Mélodies for Naxos with Michael Bundy (Baritone), and one of Rachmaninov's piano music for Signum. A Limpus prize winner and Silver Medallist of the Worshipful Company of Musicians for FRCO as a teenager, Jeremy graduated from Oxford University as Organ Scholar at Keble College, having pursued organ studies with Nicolas Kynaston and Daniel Roth in Paris. As a post-graduate he studied Piano with David Parkhouse and Hilary McNamara at the Royal College of Music in London. He later completed a PhD at Birmingham Conservatoire/Birmingham City University PhD abstract) examining aesthetic and interpretative issues in the music of Marcel Dupré. During the course of his career he has held posts at Cranleigh School, Ely Cathedral, St Luke's Chelsea, St Peter's Eaton Square, the London Oratory School, Royal Holloway College University of London and Eton College. Before moving to the US in 2008, he combined teaching positions at the Royal Academy of Music in London and the Royal Northern College of Music in Manchester with a lay clerkship in the choir of St George's Chapel, Windsor Castle. He now combines an international performing and teaching career with being Artist-in-Residence at Washington National Cathedral, Director of Music at the Church of St. Alban's and Professor of Organ at the Peabody Conservatory in Baltimore, MD. He is represented in the UK and Europe by Chameleon Arts Management and in the USA by Philip Truckenbrod Concert Artists. 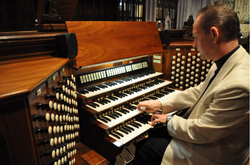 In April 2019, he moves to New York as Organist & Director of Music at the Church of St. Thomas, 5th Avenue.